Commercial Interior Design – Gold. Fun, Fun, Fun! 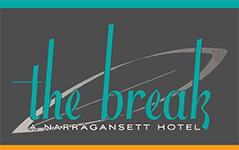 The Break, Narragansett’s freshly opened boutique hotel, swept into our office like a wave of color and light and that’s no accident. A hang ten vibe and an infusion of late ’60s surfer nostalgia, Chiappone explained, was the motivation for the hotel’s scheme. And, really, what better tone for a place of relaxation? Chiappone credits everyone involved, from the owners to the architect, for the winning outcome. But her unwavering focus — bold colors, nifty patterns, hip furnishings and what she labels coastal-inspired textures and materials (even down to the baths and wait till you see the restaurant) — ties the hotel together. Never crossing the line into cutesy, the designer has cleverly condensed summer on the shore, then and now, into one fantastic package.